Photos by Mike Moore | The Journal Gazette The Voices of Unity Youth Choir perform Sunday in front of a packed auditorium at IPFW's Rhinehart Music Center. The program helps struggling youths realize their potential and worth. 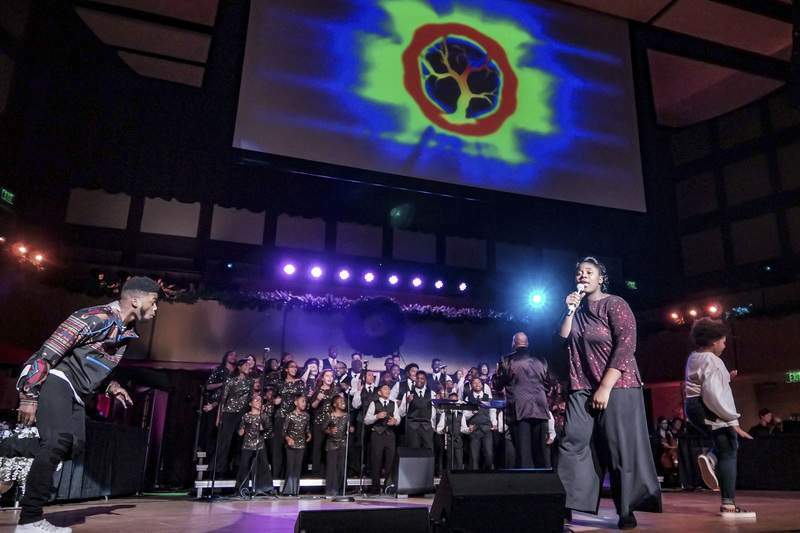 Mike Moore | The Journal Gazette Nyiann Bennett and The Voices of Unity Youth Choir perform in front of an audience during the Voices of Unity Praise Celebration held at Auer Performance Hall on Sunday. Niyoki Chapman, right, introduces members of Ambassador Enterprises during Sunday’s Voices of Unity Praise Celebration. The youth choir that brought an audience to its feet Sunday comprises some of the unlikeliest performers. Some joined with low self-esteem. Others didn't think they could sing. 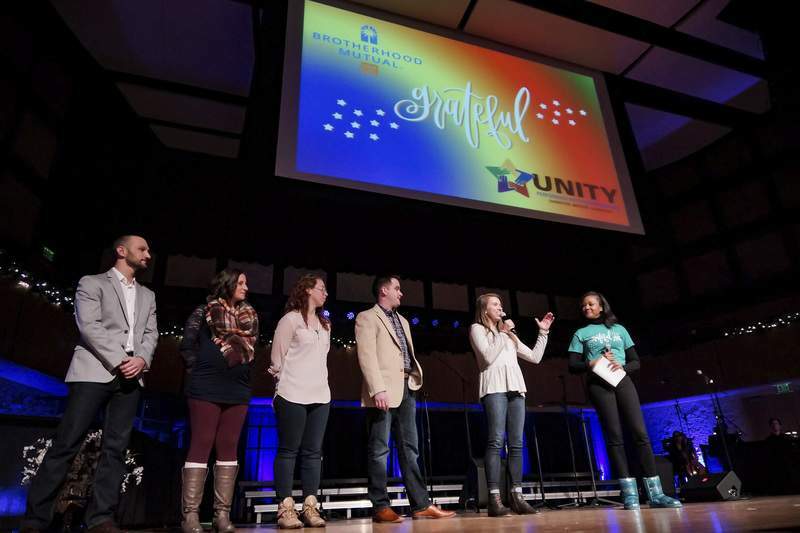 Marshall White, the Voices of Unity Youth Choir director, introduced such singers to a packed auditorium during Praise Celebration 2018 at the IPFW Rhinehart Music Center. The Unity Performing Arts Foundation's youth choral program provides an empowering environment that raises the bar for children no matter the challenges they face, such as sickness, poverty or lack of parental support. It helps youth understand the importance of believing in themselves, White said. He called it the perfect environment for children who have been overlooked and pushed aside in other settings. One new member, introduced as Rose, said she rarely smiled before joining the choir. Now, she said, she can't stop smiling. White encouraged parents and grandparents to get their children and grandchildren involved. Voices of Unity develops talent, he said, noting an alumnus has made it to Broadway. “It will change their lives forever,” he said. Deven Bridges, an alumnus of Unity's creative writing program, is pursuing a career as an independent hip-hop artist and was one of eight guest singers Sunday. 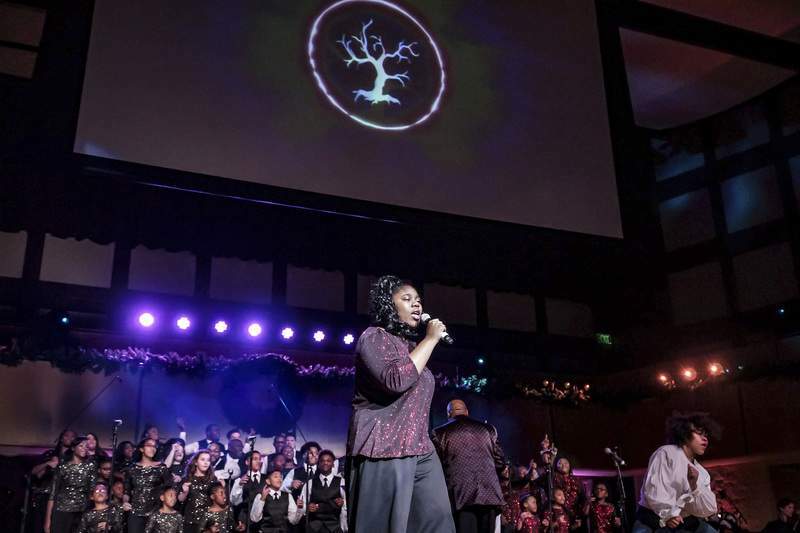 White asked the audience to financially support the choral program, noting many participants are from low-income households and receive financial assistance. “When you plant a seed, tomorrow it becomes an investment back into our community,” he said.